Among infections pertaining to head and neck rhinosinusitis holds a significant position both with regard to the prevalence and morbidity. 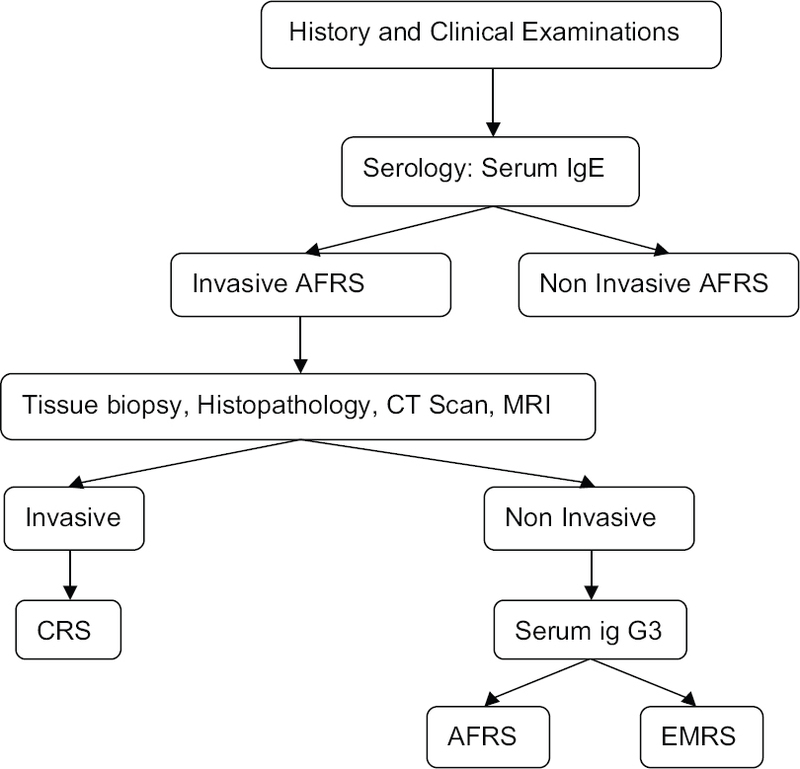 Allergic fungal rhinosinusitis (AFRS) was initially considered a counterpart of allergic bronchopulmonary aspergillosis when first diagnosed by Sa firstein in 1976 due to its clinical presentations and seemingly similar pathogenesis. Initially only Aspergillus was known as the causative, but now various other fungal species are known to cause chronic rhinosinusitis; hence, the terminology allergic fungal sinusitis was preferred. Exposure to fungi results in similar as asthma in atopic individuals, but then, some nonatopic individuals may also present with similar symptoms. It has also been studied that the presence of serum immunoglobulin E does not ensure the presence of allergy. Till date, there are several controversies regarding pathogenesis, whether humoral or immune mediated, population at risk, variations in presentations, diagnostic parameters, and treatment protocols. In this review, we try to revisit and learn from past documented experiences to further our attempt toward better understanding of the disease process, its diagnosis, and management. Background: Exposures to various aeroallergens play a crucial role in the pathogenesis of bronchial asthma (BA) and allergic rhinitis (AR). On the basis of climate change, the prevalence of aeroallergens may vary in different regions. 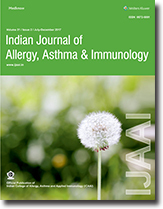 AIMS: The aim of the study was to determine the prevalence of the sensitivity to aeroallergens among patients with BA and/or AR based on skin prick test (SPT) reactivity in India. Settings And Design: This study was conducted at National Centre of Respiratory Allergy, Asthma and Immunology and Department of Respiratory Allergy and Applied Immunology, (Department of Respiratory Medicine), Vallabhbhai Patel Chest Institute, University of Delhi, Delhi-110007 (India). Subjects And Methods: A total of 4835 patients were screened from the Outpatient Department of institute during the period of August 2008 to July 2016. Out of 4835 patients, 4263 patients were performed SPT consisting of 2361 (55.38%) males and 1902 (44.62%) females, with a mean age of 30.06 years were included in the study. Diagnosis of BA and AR was made according to the GINA and ARIA guidelines, respectively. SPT was done with 58 different types of aeroallergens, which included grass pollens, weed pollens, tree pollens, dust, fungi, insects, kapok cotton, wool, and silk antigens. Statistical Analysis Used: Data analysis was done using Excel 2007. Results: Significant skin positive reaction (2 + and above) against aeroallergens were found in 1993 (46.77%) participants including 422 (9.9%) BA patients, 570 (13.37%) AR patients, and 1001 (23.48%) of both BA/AR. The younger adults aged 20–29 years were the foremost commonly affected group with 626 (14.68%) significant skin-positive patients. Among individual allergens, most common aeroallergen was mosquito (30.89%) and least common was Ehretia (0.37%). Conclusions: In different states of India, the mosquito was found the most common sensitizing allergen in BA and/or AR patients. Sensitization was the most common in the younger age group (20–29 years) patients. Context: Pediatric asthma is a serious global health problem. The recent rise in the prevalence of asthma was associated with environmental pollution, urbanization, and the change in demography. Aims: The present study was undertaken to determine the prevalence of asthma in school children of rural parts of Tumakuru district and to study its association with different epidemiological factors. Settings And Design: This study is a questionnaire-based study (International Study of Asthma and Allergies in Childhood-Questionnaire) carried out in four randomly selected rural schools of Tumakuru district. Subjects And Methods: The questionnaire was distributed to all the children (n = 1750) and asked to fill the questionnaire with the help of their parents. These questionnaires were given standard scores to diagnose asthma. Other epidemiological factors were also recorded in the questionnaire and studied. Statistical Analysis Used: The statistical analysis was done using MSTAT software. Chi-square test was used to get the P value. P < 0.05 was considered statistically significant. Results: The prevalence of asthma in our study was 3.12% (n = 51). Boys had a slightly higher prevalence 3.36% (n = 32) than girls 2.8% (n = 19). We found 58.8% (n = 30) of these asthmatics had allergic rhinitis and 19.6% (n = 10) had a history of atopy. 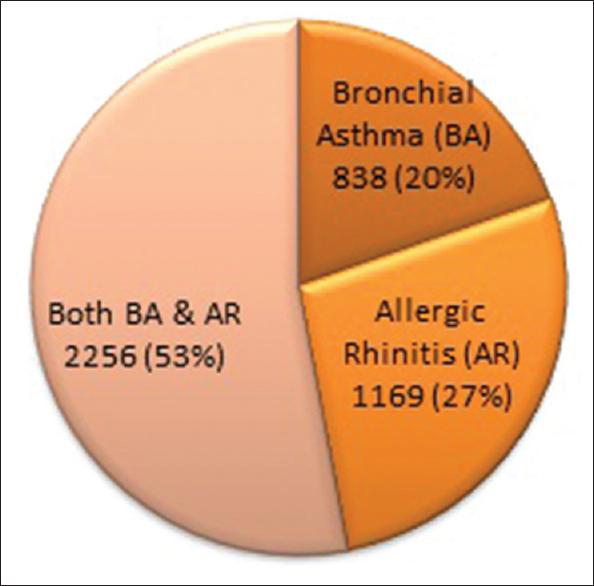 Overall prevalence of allergic rhinitis was 8.3% (n = 137) and atopy was 1.13% (n = 23). Conclusions: The study showed 3.12% of children are affected with asthma, and its prevalence is significantly associated with epidemiological factors such as family history of allergy, high socioeconomic status, and use of fire wood for cooking. Background: Breathing exercises have been described to be useful in asthma management. Objective: The aim of this study is to detect the efficacy of breathing exercises (Pranayamas) in asthma patients using spirometric indices, clinical symptoms parameters, and requirement of rescue medications. Methods: A total of 60 stable asthma patients (34 females) diagnosed and received optimal asthma treatment for 3 months or more according to the GINA guidelines were enrolled. All patients continued their respective medications and in addition performed seven breathing exercises (Surya Bhedana Pranayama, Nadi Shuddi Pranayama, Bhramari Pranayama, Surya Nadi Pranayama, Kapal Bhati, Bhastrika, and Om Chanting) under supervision at Yoga center at our Institute for 3 months after inclusion to study. Spirometry, nocturnal symptoms, and the requirement of rescue medicines were assessed before and after breathing exercise intervention. Visual analog scale (VAS) was used to assess the dyspnea and wheezing in the study participants. Results: The mean age of asthma patients was 25.45 ± 5.41 years. After breathing exercise intervention, mean forced expired volume in one second increased from 2.492 ± 0.358 L to 2.745 ± 0.343 L and mean peak expiratory flow rate increased from 283.82 ± 51.12 L/min to 336.23 ± 51.47 L/min; the increases were statistically significant. The mean nocturnal symptoms score decreased significantly from 1.416 ± 1.619 to 0.067 ± 0.362. The requirement of rescue medications decreased significantly from 6.23 ± 2.95 to 0.90 ± 1.25 puffs/week. VAS scores for breathlessness and wheezing were significantly decreased. Conclusions: Breathing exercises provided significant improvements in spirometric parameters and significant reduction in breathlessness, wheezing, and nocturnal symptoms as well as requirements of rescue medicines in asthma patients who were receiving optimal asthma treatment. Context: Asthma is a global problem, its prevalence varies among different countries and cities and age groups. In children, asthma is one of the most common chronic diseases and one of the leading causes of morbidity and mortality. Aims: This study was conducted to estimate the prevalence of asthma among children in Jazan Region (JR), Saudi Arabia. Settings And Design: This is study conducted in Jazan region, saudi arabia among school age children. It is a cross-sectional study used a modified international study os asthma and allergy in children questionnaire. Subjects And Methods: The target study population were school age, witth sample size of 1200 distributed to all geographical areas. Statistical Analysis Used: The data had been entered and analyzed using Statistical Package for Social Sciences software version 22.0. Descriptive statistics (e.g., number, percentage) and analytic statistics using Chi-square tests (χ2) to test for the association and/or the difference between two categorical variables will be applied. A P < 0.05 was considered statistically significant. Results: The total study population was 1400, most of them were Saudi (1273, 90.9%). Male students were 840 (60.0%), and female students were 560 (40.0%). According to the residency, 811 (57.9%) students were lived in rural, 64.7% of them were male, and 589 (42.1%) of participants lived in urban area. Most of the students lived in plain area (840, 60.0%), and only 16.4% of them lived in mountain area in which 63.5% of them were male. 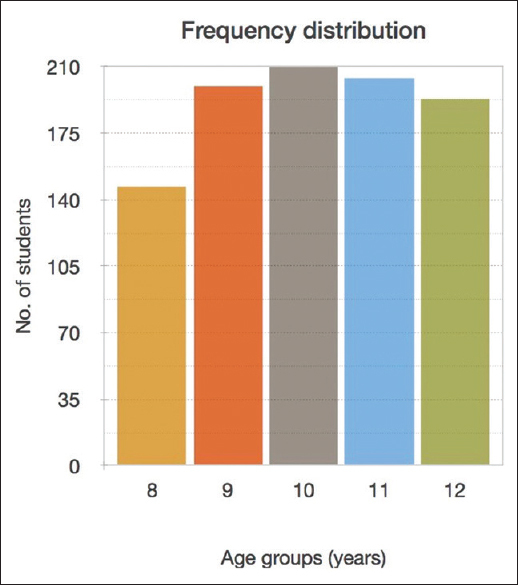 Elementary school students account 54.1% of total students; about 63% of them were male. The prevalence of life-long wheezes was 17.7%. The prevalence of exercise-induced wheeze and wheeze during the last 12 months was 206 (14.7%) and 159 (11.4%), respectively. Students with the past medical history of bronchial asthma were 212 (15.1%), with no clear statistical significant difference in frequency between male and female (P = 0.161). Asthma was confirmed by doctor in 10% of participants. Conclusions: The prevalence of asthma among children in JR is slightly higher than those reported from local and regional reports. Background: Onset of wheezing before 3 years of age is concerning due to its potential for the development of asthma. Different risk factors, atopic manifestations, and Vitamin D deficiency are attributed to it. Aims: The aim of this study is to assess the factors influencing the age of wheezing onset among children with early-onset recurrent wheezing and the association of Vitamin D status with different atopic manifestations. Subjects And Methods: This cross-sectional observational study included 141 children aged from 1 month to 14 years with recurrent wheezing. Onset of wheezing after 36 months was excluded from the study. Different risk factors and atopic manifestations were recorded, and Vitamin D levels were measured. Descriptive analysis, independent t-test, analysis of variance, and regression analysis were done using SPSS version 24.0. Results: Of 141 children, 65 (46.0%) had onset of wheezing at <1 year of age. Children with onset of wheezing <1 year had early age of presentation (29.38 ± 29.35 vs. 46.25 ± 27.77 months) were predominately male (52.1% vs. 47.9%) and had a low birth weight (2688.46 ± 608.84 vs. 2904.61 ± 510.96 g) and high Vitamin D level (22.01 ± 12.63 vs. 16.65 ± 9.05 ng/mL; P < 0.05). In the regression analysis, birth weight, family with >1 sibling, and atopic dermatitis had regression coefficients of 0.393 (P < 0.01), 4.525 (P < 0.01), and −2.970, respectively (P > 0.05). Conclusions: Children with onset of wheezing before 1 year were predominantly male and had a lower birth weight. Vitamin D deficiency does not hasten the onset of wheezing; however, a low birth weight and associated atopic dermatitis hasten the onset of wheezing, and being part of a family with >1 sibling delays onset. 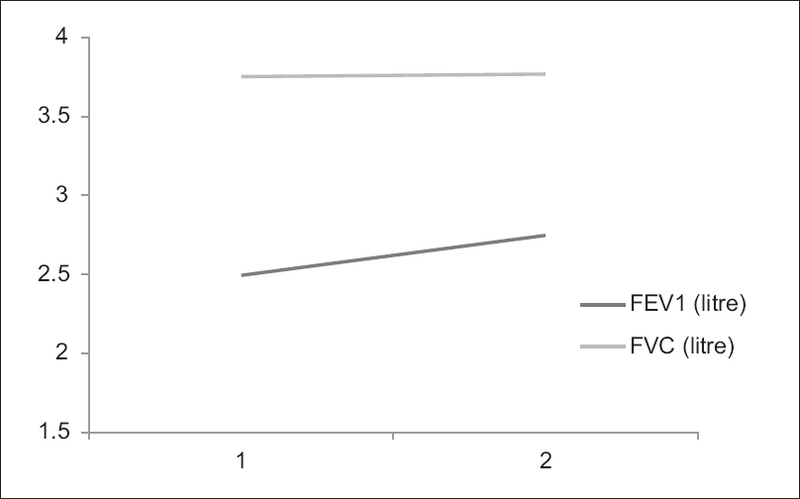 Objective: To obtain the normal reference values of peak expiratory flow rates (PEFRs) among healthy school-going children between 8 and 12 years and thereby construct a nomogram. Materials And Methods: A cross-sectional study was conducted among healthy children attending schools in Ernakulam district over a period of 1 year. PEFR values were recorded using a Mini-Wright peak flow meter, and the best of three readings was documented. Results: Nine hundred and fifty-four students were studied. PEFR increases as the age increases. A similar trend was observed across various heights. Nomograms based on age and height were constructed separately for boys and girls. Conclusion: Established baseline values of PEFR in this study can be useful in diagnosing and following asthmatic children in Ernakulam district. Background: Prawn is one of the major sources of shellfish allergens, which will induce mild to severe allergic reactions. Aim: The objective of this study was to predict putative allergens and its characteristics present in Marsupenaeus japonicus through an in silico approach. Materials And Methods: In this present study, in silico tools, RaptorX, Bepipred Linear Epitope and Parker Hydrophilicity Prediction method, and MHC2Pred were used to predict the putative and cross-reactive allergens, tertiary and secondary structures, B-cell linear epitopes, and T-cell epitopes, respectively. Results: As a result, eight putative and cross-reactive allergens including tropomyosin fast isoform, arginine kinase, sarcoplasmic calcium binding protein, myosin light chain, chymotrypsin like proteinase, superoxide dismutase, cathepsin B, and trypsin were predicted by analyzing the protein sequences of M. japonicus. Furthermore, five amino acids (Ala, Ser, Asn, Gly, and Lys) play a vital role in immunoglobulin E binding allergenic epitope. At least one of them was found in the predicted B-cell epitope for each of the predicted putative allergens. Moreover, the predicted T-cell epitopes were highly associated with human leukocyte antigen (HLA) DRB1*0101 and HLA-DRB1*0901 alleles while mediating T-cell immune responses. Conclusion: These results can be utilized to contribute in peptide immunotherapy and reduce the allergic diseases related to shellfish. Endobronchial aspergilloma is a rare, noninvasive aspergillosis. It may be associated with a parenchymal lesion and/or cavity. We describe a case of endobronchial aspergillosis mimicking bronchogenic carcinoma subsequently removed completely through fiber-optic bronchoscope itself. This case report, while highlighting the existence of this unique clinical entity, also throws light on potential treatment option which can be curative.